The Northern Colorado Regional Airport is located adjacent to Interstate 25 in North West Loveland. Access to the Airport is via the Interstate frontage road on the West side of I-25. To reach the Airport traveling northbound on I-25, take Exit #259/Crossroads Blvd. At the roundabout take the 3rd exit onto E Crossroads Blvd, at the next roundabout take the 1st exit and stay on E Crossroads Blvd, turn right on Byrd Dr, then turn left on Earhart Rd, the Airport is at the end. If you are traveling southbound on I-25 exit at #262/Colorado Highway 392, turn right onto CO-392, then turn left onto the 1st cross street onto SW Frontage Rd for approximately two miles, then turn right onto Earhart Rd, the Airport is at the end. 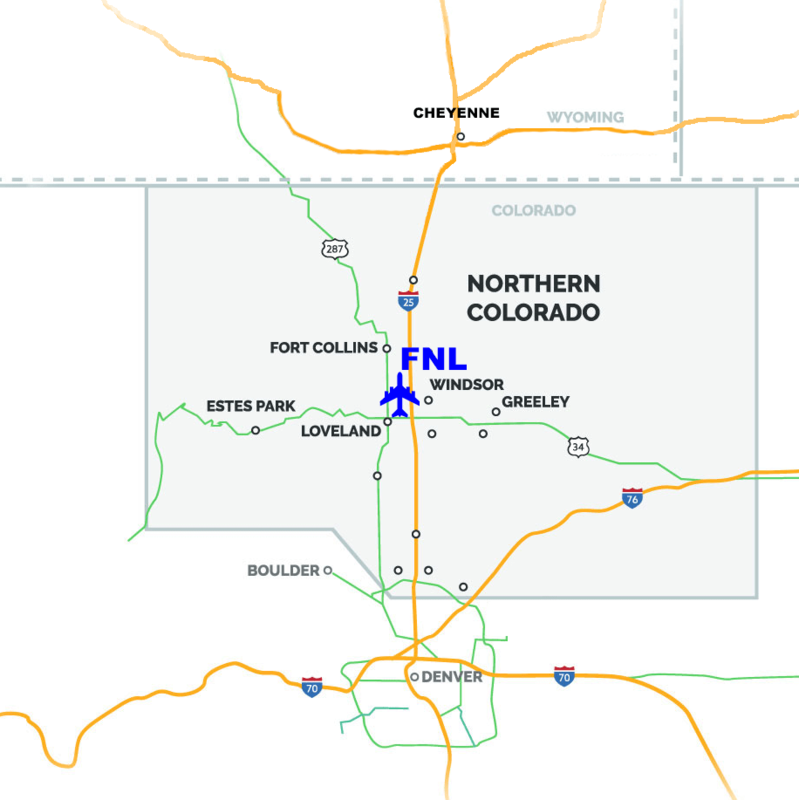 NOTE: Southbound travelers may be impacted by the North I-25 Express Lanes: Johnstown to Fort Collins project; which will occur from 2018-2022. Please follow this link for CDOT’s project schedule and details. Parking spots in front of the terminal (East side) are reserved for airline customers. Parking is $5 per night. For security, this lot is patrolled by local law enforcement. Instructions are located on the kiosk. Please place your payment receipt face up in plain view on your vehicle’s dash prior to going through security screening.